The YouTube channel Reactions features episodes that explain why certain foods are the way they are, through the lens of science. The channel has come up with a video that pays special attention to how the main varieties of hard ice creams, soft serves, custards, and sherbets are created. In the video, American University’s Dr. Matthew Hardings explains that the ice crystals in the ice cream determine its consistency. Essentially, the bigger the crystal gets, the harder and crunchier your ice cream will be. So, how do you get your ice crystals to be small? The first way is to get an emulsifier in your ice cream. This way, the water and fat molecules in the ice cream will mix together, thus preventing water molecules to clump together and form bigger crystals. The second way is by changing how fast the water freezes. If the ice crystals are frozen rapidly, they will be smaller; however, if frozen over a longer period of time, they will end up being bigger. To prove his point, Dr. Hardings made ice cream three ways: in a regular ice cream maker, which churned the ice cream slowly; put together in a bag with salt (which changes the freezing point of water to achieve lower temperatures) and ice; and mixed with liquid nitrogen. 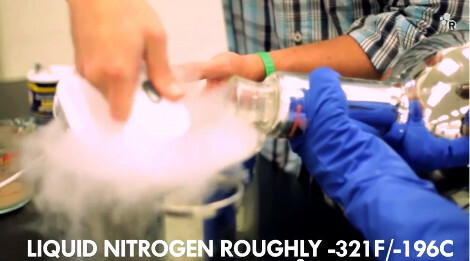 Pouring in liquid nitrogen proved to be the winner in reaching a creamier texture.